The fourth season of the television series The Wire commenced airing in the United States on September 10, 2006, concluded on December 10, 2006, and contained 13 episodes. It introduces Baltimore's school system and several middle school students while continuing to examine the remnants of the Barksdale Organization, the ascendant Stanfield Organization, the Baltimore Police Department and politicians. The fourth season aired on Sundays at 9:00 pm ET in the United States. 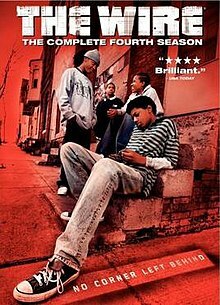 The season was released on DVD as a four disc boxed set under the title of The Wire: The Complete Fourth Season on December 4, 2007 by HBO Video. Playwright and television writer/producer Eric Overmyer joined the crew for the show's fourth season as a consulting producer and writer. He had previously worked on Homicide and was brought into the full-time production staff to replace George Pelecanos who scaled back his involvement in order to concentrate on his next book and he worked on the fourth season solely as a writer.David Mills, Emmy-award winner, Homicide and The Corner writer and college friend of Simon, joined the writing staff in the fourth season. Regular writer Ed Burns became a producer on The Wire in this season. The focus of the fourth season shifted between a local school, the mayoral election, police department politics and action on the street corners. The returning starring cast consisted of Dominic West as Officer Jimmy McNulty, the formerly insubordinate detective who attempts to shed his ability and his problems in favor of a better life. West was at the time homesick and wanting to spend time with his young daughter in England; he also felt the character's plot arc had reached a reasonable end point in season 3, so West arranged with the writers for McNulty's role to be greatly reduced in Season 4. Lance Reddick reprised his role as newly promoted Major Cedric Daniels, now commanding the western district. One of Daniels's sergeants within the district was Sergeant Ellis Carver, portrayed by Seth Gilliam. Robert Wisdom reprised his role as former western district commander Howard "Bunny" Colvin, who has become a field researcher after a short stint working in hotel security following his retirement from the Baltimore Police Department. The Major Crimes Unit saw a shift in personnel this season. Kima Greggs, portrayed by Sonja Sohn, and Lester Freamon, portrayed by Clarke Peters, transferred to the Homicide Unit after the new lieutenant of the Major Crimes Unit ends the wire and halts Freamon's investigation of the Barksdale money. Corey Parker-Robinson portrayed Detective Leander Sydnor, one of two detectives who remain in the Major Crimes Unit after the arrival of the new lieutenant. Domenick Lombardozzi returned as Thomas "Herc" Hauk, a former member of the Major Crimes Unit whose work on the mayor's security detail earns him a promotion to sergeant and a transfer back to his old unit after Freamon and Greggs' departure. Wendell Pierce portrayed veteran homicide detective Bunk Moreland. Deirdre Lovejoy starred as assistant state's attorney Rhonda Pearlman, the legal liaison between the unit and the courthouse. Andre Royo returned as Bubbles, who continued to indulge his drug addiction and act as an occasional informant. Jim True-Frost portrayed Roland "Prez" Pryzbylewski, a former member of the Major Crimes Unit who has become a teacher in an inner city school after inadvertently killing a fellow officer in season three. The police were overseen by two commanding officers more concerned with politics and their own careers than the case, Deputy Commissioner of Operations William Rawls (John Doman) and Commissioner Ervin Burrell (Frankie Faison). At city hall, Tommy Carcetti (Aidan Gillen) was an ambitious city councilman seeking to become mayor. Joining the cast for the fourth season was Reg E. Cathey as Carcetti's deputy campaign manager, Norman Wilson. Also joining the cast after having a recurring role during the third season was Glynn Turman as Mayor Clarence Royce. On the streets, former Barksdale crew chief Bodie Broadus (J.D. Williams) joined the organization of new drug kingpin Marlo Stanfield (Jamie Hector). Michael K. Williams portrayed renowned stick-up man Omar Little. Joining the cast this season after having a recurring role in season three is Chad L. Coleman as Dennis "Cutty" Wise, a reformed member of the Barksdale organization who has opened a boxing gym for neighborhood children. Two members of the third season starring cast did not return for the fourth season following the termination of their characters' storylines. Both Wood Harris (Avon Barksdale) and Idris Elba (Stringer Bell) left the starring cast in the final episode of the third season. Many guest stars from the earlier seasons reprised their roles. Proposition Joe (Robert F. Chew), the East Side's cautious drug kingpin, became more cooperative with the Stanfield Organization following the death of Stringer Bell. His lieutenant, and nephew, "Cheese" (Method Man) continued to elude the Major Crimes Unit investigation. Hassan Johnson reprises his role as incarcerated Barksdale enforcer Wee-Bey Brice. Former Barksdale enforcer Slim Charles (Anwan Glover) returned as a new recruit to Proposition Joe's organization. Several members of the Stanfield Organization introduced in season three also returned: Chris Partlow (Gbenga Akinnagbe), Stanfield's chief enforcer; and Felicia "Snoop" Pearson (Felicia Pearson), Partlow's protégé. Tray Chaney continues to portray former Barksdale crew chief Poot Carr, who joins the Stanfield organization this season. Michael Hyatt reprised her role as Brianna Barksdale. Michael Kostroff returned as the defence attorney Maurice Levy. Isiah Whitlock, Jr. reprised his role as corrupt State Senator Clay Davis whose involvement with Barksdale money causes him trouble with the Major Crimes Unit. Omar Little's crew shifted focus to the Stanfield Organization and the New Day Co-op and consisted of his new boyfriend Renaldo (Ramón Rodríguez), partner Kimmy (Kelli R. Brown), and advisor Butchie (S. Robert Morgan). Many guest stars also reprised their characters from the police department. Returning guest stars in the homicide unit included Delaney Williams as Sergeant Jay Landsman, Ed Norris as Detective Ed Norris, and Brian Anthony Wilson as Detective Vernon Holley. Al Brown and Jay Landsman reprised their roles as Major Stan Valchek and Lieutenant Dennis Mello. Michael Salconi recurred as veteran Western patrolman Michael Santangelo.Gregory L. Williams played Michael Crutchfield, a cantankerous homicide detective. Joilet F. Harris returned as Caroline Massey, an officer in the Major Crimes Unit. Joining the Major Crimes Unit this season is Kenneth Dozerman (Rick Otto). In the western district, Carver's squad includes Anthony Colicchio (Benjamin Busch), Lloyd "Truck" Garrick (Ryan Sands), and Lambert (Nakia Dillard). In the political storyline, Cleo Reginald Pizana returned as Coleman Parker, Royce's chief-of-staff. Brandy Burre appeared as Theresa D'Agostino, a political campaign consultant. Frederick Strother performed as Odell Watkins, a state delegate and political king-maker. Christopher Mann played Carcetti's city council colleague Anthony Gray. Maria Broom returns as Marla Daniels, the estranged wife of Major Daniels who is running for a seat on the city council. The fourth season also saw the return of two former starring characters from the second season: Amy Ryan as Officer Beadie Russell, an officer at the port and Jimmy McNulty's domestic partner, and Paul Ben-Victor as Spiros Vondas, the second in command of the Greek's drug smuggling operation. The shift of focus to the schools saw the introduction of four young actors in major recurring roles this season: Jermaine Crawford as Duquan "Dukie" Weems; Maestro Harrell as Randy Wagstaff; Julito McCullum as Namond Brice; and Tristan Wilds as Michael Lee. The characters are friends from a West Baltimore middle school. Other new characters from the school included Tootsie Duvall as Assistant Principal Marcia Donnelly; David Parenti (Dan DeLuca), a Professor of Sociology at the University of Maryland who works with Bunny Colvin in the school to study potential violent offenders; Stacie Davis portrayed Miss Duquette, a doctoral student who works with Parenti and Colvin; Aaron "Bug" Manigault (Keenon Brice), Michael Lee's younger brother; Kenard (Thuliso Dingwall), one of the younger members of Namond Brice's circle of friends; and Richard Hidlebird as Principal Claudell Withers. The fourth season of The Wire has been widely hailed as one of the greatest seasons of television ever produced. It is listed as one of the highest rated individual TV seasons of all time on Metacritic with a score of 98 out of 100 based on 21 critics—including 17 perfect score reviews. All episodes were made available by HBO six days earlier than their broadcast date, via On Demand. Four West Baltimore boys wrestle with what to do with the rest of their summer vacation. When unkempt outcast Duquan "Dukie" Weems is beaten up by a neighbouring group of children, Michael Lee is the quiet leader of the group's retaliation. Randy Wagstaff has the imagination to plan the endeavour. Namond Brice is the most outspoken and the richest of the four. Roland "Prez" Pryzbylewski prepares for his new career as a school teacher. The Major Crimes Unit continues with its wiretap investigation into the Stanfield Organization. They remain unaware that when Marlo Stanfield orders a death the target is taken to a vacant building and killed by enforcers Chris Partlow and Snoop. Randy is unwittingly involved in one such murder. The mayoral election campaign between councilman Tommy Carcetti and incumbent mayor Clarence Royce begins to take shape. Thomas "Herc" Hauk is now working for the Mayor's security detail. He catches Royce in a compromising position and learns how to spin it into a promotion opportunity. Namond visits his father, Wee-Bey Brice, in prison. Wee-Bey urges Namond to work harder at his job with drug dealer Bodie Broadus but Namond swaps it with Michael as he is in greater financial need. Bunk Moreland investigates a murder but finds his prime suspect missing. Rhonda Pearlman and Lester Freamon argue over delivering subpoenas to political figures. Another murder involving a state's witness gives Carcetti damaging ammunition in a debate with Royce. Marlo gives money away to the neighborhood children and Michael catches his attention when he refuses the handout. Dennis "Cutty" Wise continues to run the community boxing gym and also notices Michael because of his aptitude for the sport. Bubbles mentors young and homeless Sherrod in his junk selling business. Royce strikes back against Carcetti with his mayoral powers; however, he alienates State Delegate Watkins over his refusal to fund witness protection. Carcetti impresses Watkins by his reserved behaviour at the funeral of the murdered witness. Bunk visits Jimmy McNulty and Beadie Russell for dinner and finds McNulty sober and enjoying domestic life. Marlo Stanfield visits Bodie's corner and muscles him into selling the Stanfield package. Marlo is impressed with Michael a second time when he sees him working for Bodie. Proposition Joe and his New Day Co-Op face problems on two fronts; New York drug dealers on the East side and the Stanfield Organization in the West; they agree to attempt to negotiate with Marlo. Omar Little robs a Stanfield stash house. Rawls sends a caustic new lieutenant to gut the major case unit from the inside. Freamon and Kima Greggs leave for the homicide unit. Howard "Bunny" Colvin embarks on a new career as a researcher into violent behaviour. Prez is shocked by a violent incident in his classroom. As the homicide unit's newest detective Greggs is assigned to the high-profile witness case in an attempt to stall the investigation until after the election. Freamon joins Bunk on finding his missing suspect and realizes the connection to the lack of violence from the Stanfield Organization. Freamon suggests the suspect has been killed and his body hidden. Marlo loses big in a poker game and decides to take over Bodie's corner. Chris and Snoop assess Michael as a potential recruit. Proposition Joe manipulates Omar into robbing Marlo's next card game. Watkins becomes more angry with Royce when he sees he has reneged on a promise to back his protege Marla Daniels for a council seat. Randy is caught skipping school and becomes a reluctant informant for the teachers. Carcetti learns that Greggs has been assigned the witness case and uses the information against Royce. Watkins forms an alliance with Carcetti. Now a sergeant in the major case unit, Herc takes part in a series of ill-advised raids that fail to render any significant arrests. Herc takes a video camera without permission to surveil Stanfield. Marlo tries to enlist Michael but he rejects the offer. Marlo arranges to have Omar framed for murder. Dukie debunks Randy's theory that the Chris and Snoop's victims are undead and shows him the bodies. Prez struggles to control his students' behaviour. Bubbles is beaten by another drug addict and throws Sherrod out for skipping school. Namond is pushed into drug dealing by his mother when they are cut off by the remnants of the Barksdale Organization (who had been supporting them). Randy reveals his involvement in the murder to his teachers and is placed under Sergeant Ellis Carver's care. Marlo proves elusive despite Herc's camera. Colvin's new special class separates the worst behaved students (known as "Corner Kids") from their peers. Carcetti wins the election despite a last minute smear campaign. Omar is arrested for the murder Marlo organized. Royce and Carcetti make their peace. Prez has a good day with his class minus the "corner kids". Omar convinces Bunk to help him prove his innocence. Greggs uses "soft eyes" at a crime scene and finds the witness killing was accidental. Marlo steals Herc's surveillance camera provoking him into a more direct approach. Carver hands Randy over to Herc who fails to understand the importance of his story. Sherrod begins working in the drug trade and fights with Namond over territory. After receiving a beating Namond disrupts Colvin's class. Proposition Joe continues to court Marlo's involvement with the Co-Op. Colvin uses corner logic in class and is greeted with enthusiasm, particularly from Namond. Michael is devastated when his stepfather returns to live with him. Bunk exposes the frame on Omar but antagonizes his colleagues by meddling in the case. Herc stops Chris and Snoop and fails to realize the significance of the tools he finds in their car - they use them to conceal the corpses of their victims. Carcetti makes the rounds and discusses his plans as Mayor and his intentions for the future. He considers employing a new police commissioner and Cedric Daniels sees his stock rising. Bubbles identifies a witness for Herc but Herc fails to return the favor by protecting him from his tormentor. Colvin offers an incentive to his class. Old Face Andre turns to Proposition Joe for protection after his ineptitude in the framing of Omar. Joe ingratiates himself with Marlo by handing Andre over to Chris and Snoop. Marlo finally joins the Co-Op and his enforcers begin to take on the New York drug dealers. Carver warns Namond about his drug dealing. Carcetti restricts commissioner Ervin Burrell's authority and insists on a promotion for Daniels. Michael takes his problem with his step father to Marlo. Omar plans revenge on Marlo and Proposition Joe. Burrell's new mandate for quality of life arrests is met with civil disobedience and political maneuvering. Chris takes care of Michael's problem. Marlo has a member of Bodie's crew killed after he is interviewed by Herc and orders word spread about Randy for the same reason. Carver arrests Namond and he reaches out to Colvin for help. After another beating, Bubbles gets revenge for Herc's continual betrayals by setting him up to arrest a minister. The teachers are pressured to teach test material despite their recent successes. Carcetti faces a dilemma over a complaint from the minister against Herc. Carcetti galvanizes other departments into action with non-specific complaints. Randy faces bullying from his school mates after he is exposed as an informant. Omar tricks Proposition Joe into giving away the timing of his next shipment. Freamon is tempted back to Major Crimes by Daniels and has a revelation regarding the hiding place of the missing bodies. Prez is rankled by Dukie's social promotion to high school after having become close to him. Omar orchestrates the theft of the Co-Op's shipment. Michael trains as an enforcer in the Stanfield Organization and violently alienates Cutty and Namond. Randy is kept home for his own protection but an arson attack on his home leaves his foster mother horribly burned. Herc is suspended for his loss of the camera. Freamon's discovery of bodies in vacant houses damages the homicide unit's annual clearance rate. Daniels realizes the statistics can be blamed on Royce so Carcetti approves a city wide search. Carcetti faces a massive school budget deficit and is forced to go to the governor for assistance. Bubbles prepares a lethal vial of narcotics for his tormentor but Sherrod takes it unwittingly and dies. Bubbles attempts suicide after confessing his part in Sherrod's death and is taken to rehab. Freamon begins to build his investigation and has Chris and Snoop brought in for DNA samples. Bodie reaches breaking point over Marlo's murder of his people and turns to McNulty. Bodie is later killed on his corner because he was seen leaving central booking with McNulty. McNulty decides to rejoin the Major Crimes Unit. Proposition Joe is forced to reveal his supplier to Marlo to reassure the Co-Op after Omar's robbery. Marlo meets with Spiros Vondas who vouches for Joe. Omar brazenly sells the stolen drugs back to the Co-Op. Carcetti rejects the Governor's offer of assistance with the schools as it would cost his career too much in the future. Despite Carver's efforts to prevent it, Randy is reluctantly returned to a group home. Colvin's special class is shut down by the education board. However, he persuades Namond's parents to let Namond live with him in order to keep him away from drug dealing. Michael commits his first murder and is given Bodie's corner to run; Dukie is unable to settle in high school and joins his crew. ^ "The Wire - Want Some Holiday Scoop? Release Date, Lower-Than-Typical Cost for HBO's 4th Season". TVShowsOnDVD.com. September 3, 2007. Archived from the original on November 2, 2007. Retrieved November 26, 2007. ^ "Cast & Crew - Dominic West as Jimmy McNulty". HBO. 2008. Retrieved January 15, 2008. ^ "Character profile - Jimmy McNulty". HBO. 2006. Retrieved December 19, 2007. ^ Abrams, Jonathan (2018). All the Pieces Matter. Crown Archetype. p. 231-232. ISBN 978-0-451-49814-4. ^ "Cast & Crew - Lance Reddick as Cedric Daniels". HBO. 2008. Retrieved January 15, 2008. ^ "Character profile - Lieutenant Cedric Daniels". HBO. 2006. Retrieved December 19, 2007. ^ "Cast & Crew - Seth Gilliam as Ellis Carver". HBO. 2008. Retrieved January 15, 2008. ^ "Cast & Crew - Robert Wisdom as Howard "Bunny" Colvin". HBO. 2008. Retrieved January 15, 2008. ^ "Cast & Crew - Sonja Sohn as Shakima "Kima" Greggs". HBO. 2008. Retrieved January 15, 2008. ^ "Character profile - Detective Shakima "Kima" Greggs". HBO. 2006. Retrieved December 19, 2007. ^ "Cast & Crew - Clarke Peters as Lester Freamon". HBO. 2008. Retrieved January 15, 2008. ^ "Character profile - Lester Freamon". HBO. 2006. Retrieved December 19, 2007. ^ "Cast & Crew - Corey Parker Robinson as Leander Sydnor". HBO. 2008. Retrieved January 15, 2008. ^ "Cast & Crew - Domenick Lombardozzi as Thomas "Herc" Hauk". HBO. 2008. Retrieved January 15, 2008. ^ "Character profile - Thomas "Herc" Hauk". HBO. 2006. Retrieved December 19, 2007. ^ "Cast & Crew - Wendell Pierce as William "Bunk" Moreland". HBO. 2008. Retrieved January 15, 2008. ^ "Character profile - Bunk Moreland". HBO. 2006. Retrieved December 19, 2007. ^ "Cast & Crew - Deirdre Lovejoy as Rhonda Pearlman". HBO. 2008. Retrieved January 15, 2008. ^ "Character profile - Rhonda Pearlman". HBO. 2006. Retrieved December 19, 2007. ^ "Cast & Crew - Andre Royo as Bubbles". HBO. 2008. Retrieved January 15, 2008. ^ "Character profile - Bubbles". HBO. 2006. Retrieved December 19, 2007. ^ "Cast & Crew - Jim True-Frost as Roland "Prez" Pryzbylewski". HBO. 2008. Retrieved August 6, 2008. ^ "Cast & Crew - Frankie R. Faison as Ervin Burrell". HBO. 2008. Retrieved January 15, 2008. ^ "Character profile - Ervin Burrell". HBO. 2006. Retrieved December 19, 2007. ^ "Cast & Crew - John Doman as William Rawls". HBO. 2008. Retrieved January 15, 2008. ^ "Character profile - William Rawls". HBO. 2006. Retrieved December 19, 2007. ^ "Cast & Crew - Aidan Gillen as Thomas "Tommy" Carcetti". HBO. 2008. Retrieved January 15, 2008. ^ "Character profile - Thomas "Tommy" Carcetti". HBO. 2008. Retrieved January 15, 2008. ^ "Cast & Crew - Reg E. Cathey as Norman Wilson". HBO. 2008. Retrieved August 6, 2008. ^ "Cast & Crew - Glynn Turman as Clarence Royce". HBO. 2008. Retrieved August 6, 2008. ^ "Cast & Crew - JD Williams as Preston "Bodie" Broadus". HBO. 2008. Retrieved January 15, 2008. ^ "Character profile - Preston "Bodie" Broadus". HBO. 2006. Retrieved December 19, 2007. ^ "Character profile - Marlo Stanfield". HBO. 2004. Retrieved August 14, 2006. ^ "Cast & Crew - Michael Kenneth Williams as Omar Little". HBO. 2008. Retrieved January 15, 2008. ^ "Character profile - Omar Little". HBO. 2006. Retrieved December 19, 2007. ^ "Cast & Crew - Wood Harris as Avon Barksdale". HBO. 2008. Retrieved January 15, 2008. ^ "Character profile - Avon Barksdale". HBO. 2006. Retrieved December 19, 2007. ^ "Cast & Crew - Idris Elba as Stringer Bell". HBO. 2008. Retrieved January 15, 2008. ^ "Character profile - Stringer Bell". HBO. 2006. Retrieved December 19, 2007. ^ "Cast & Crew - Robert F. Chew as Proposition Joe Stewart". HBO. 2008. Retrieved January 15, 2008. ^ "Character profile - Proposition Joe Stewart". HBO. 2008. Retrieved January 15, 2008. ^ "Cast & Crew - Method Man as Melvin "Cheese" Wagstaff". HBO. 2008. Retrieved January 15, 2008. ^ "Character profile - Melvin "Cheese" Wagstaff". HBO. 2008. Retrieved January 15, 2008. ^ "Cast & Crew - Hassan Johnson as Roland "Wee-Bey" Brice". HBO. 2008. Retrieved January 15, 2008. ^ "Character profile - Roland "Wee-Bey" Brice". HBO. 2008. Retrieved January 15, 2008. ^ "Cast & Crew - Anwan Glover as Slim Charles". HBO. 2008. Retrieved January 15, 2008. ^ "Character profile - Slim Charles". HBO. 2008. Retrieved January 15, 2008. ^ "Cast & Crew - Gbenga Akinnagbe as Chris Partlow". HBO. 2008. Retrieved January 15, 2008. ^ "Character profile - Chris Partlow". HBO. 2008. Retrieved January 15, 2008. ^ "Cast & Crew - Felicia Pearson as Felicia "Snoop" Pearson". HBO. 2008. Retrieved January 15, 2008. ^ "Character profile - Felicia "Snoop" Pearson". HBO. 2008. Retrieved January 15, 2008. ^ "Cast & Crew - Tray Chaney as Malik "Poot" Carr". HBO. 2008. Retrieved January 15, 2008. ^ "Character profile - Malik "Poot" Carr". HBO. 2006. Retrieved December 19, 2007. ^ "Cast & Crew - Michael Hyatt as Brianna Barksdale". HBO. 2008. Retrieved January 15, 2008. ^ "Character profile - Brianna Barksdale". HBO. 2008. Retrieved January 15, 2008. ^ "Cast & Crew - Michael Kostroff as Maurice "Maury" Levy". HBO. 2008. Retrieved January 15, 2008. ^ "Character profile - Maurice "Maury" Levy". HBO. 2008. Retrieved January 15, 2008. ^ "Cast & Crew - Isiah Whitlock, Jr. as R. Clayton "Clay" Davis". HBO. 2008. Retrieved January 15, 2008. ^ "Character profile - R. Clayton "Clay" Davis". HBO. 2008. Retrieved January 15, 2008. ^ "Org Chart - The Street". HBO. 2004. Retrieved July 27, 2006. ^ "Cast & Crew - Delaney Williams as Jay Landsman". HBO. 2008. Retrieved January 15, 2008. ^ "Character profile - Jay Landsman". HBO. 2006. Retrieved December 19, 2007. ^ "Cast & Crew - Ed Norris as Ed Norris". HBO. 2008. Retrieved January 15, 2008. ^ "Character profile - Ed Norris". HBO. 2008. Retrieved January 15, 2008. ^ a b c d "Org Chart - The Law". HBO. 2004. Retrieved July 22, 2006. ^ "Cast & Crew - Al Brown as Stanislaus Valchek". HBO. 2008. Retrieved January 15, 2008. ^ "Character profile - Stanislaus Valchek". HBO. 2008. Retrieved January 15, 2008. ^ "Cast & Crew - Jay Landsman as Dennis Mello". HBO. 2008. Retrieved January 15, 2008. ^ "Character profile - Dennis Mello". HBO. 2008. Retrieved January 15, 2008. ^ "Cast & Crew - Gregory L. Williams as Michael Crutchfield". HBO. 2008. Retrieved January 15, 2008. ^ "Character profile - Detective Michael Crutchfield". HBO. 2008. Retrieved January 14, 2008. ^ "Cast & Crew - Joilet F. Harris as Caroline Massey". HBO. 2008. Retrieved January 15, 2008. ^ "Character profile - Caroline Massey". HBO. 2008. Retrieved January 15, 2008. ^ "Cast & Crew - Rick Otto as Kenneth Dozerman". HBO. 2008. Retrieved January 15, 2008. ^ "Character profile - Kenneth Dozerman". HBO. 2008. Retrieved January 15, 2008. ^ "Character profile - Coleman Parker". HBO. 2008. Retrieved January 15, 2008. ^ "Cast & Crew - Brandy Burre as Theresa D'Agostino". HBO. 2008. Retrieved January 15, 2008. ^ "Character profile - Theresa D'agostino". HBO. 2008. Retrieved January 15, 2008. ^ "Cast & Crew - Frederick Strother as Odell Watkins". HBO. 2008. Retrieved January 15, 2008. ^ "Character profile - Odell Watkins". HBO. 2008. Retrieved January 15, 2008. ^ "Cast & Crew - Christopher Mann as Anthony Gray". HBO. 2008. Retrieved January 15, 2008. ^ "Character profile - Anthony Gray". HBO. 2008. Retrieved January 15, 2008. ^ "Character profile - Marla Daniels". HBO. 2004. Retrieved July 22, 2006. ^ "Cast & Crew - Jermaine Crawford as Duquan "Dukie" Weems". HBO. 2008. Retrieved January 15, 2008. ^ "Cast & Crew - Maestro Harrell as Randy Wagstaff". HBO. 2008. Retrieved January 15, 2008. ^ "Cast & Crew - Julito McCullum as Namond Brice". HBO. 2008. Retrieved January 15, 2008. ^ "Cast & Crew - Tristan Wilds as Michael Lee". HBO. 2008. Retrieved January 15, 2008. ^ "Character profile - Namond Brice". HBO. 2008. Retrieved January 15, 2008. ^ "Character profile - Michael Lee". HBO. 2008. Retrieved January 15, 2008. ^ "Character profile - Randy Wagstaff". HBO. 2008. Retrieved January 15, 2008. ^ "Character profile - Duquan "Dukie" Weems". HBO. 2008. Retrieved January 15, 2008. ^ "Character profile – Assistant Principal Marcia Donnelly". HBO. 2006. Retrieved October 29, 2006. ^ "Character profile – UM Professor David Parenti". HBO. 2004. Retrieved October 28, 2006. ^ "Character profile – Kenard". HBO. 2004. Retrieved October 29, 2006. ^ "Character profile – Principal Claudell Withers". HBO. 2006. Retrieved October 29, 2006. ^ "The Wire: Season 4". Metacritic. Retrieved July 15, 2012. ^ Sepinwall, Alan (December 31, 2007). "The Wire week 1 thread for the On Demand'ers". What's Alan Watching?. Retrieved November 23, 2013. ^ "Episode guide - episode 38 boys of summer". HBO. 2004. Retrieved August 9, 2006. ^ "Episode guide - episode 39 Soft Eyes". HBO. 2006. Retrieved August 9, 2006. ^ "Episode guide - episode 40 Home Rooms". HBO. 2006. Retrieved September 25, 2006. ^ "Episode guide - episode 41 Refugees". HBO. 2006. Retrieved October 3, 2006. ^ "Episode guide - episode 42 Alliances". HBO. 2006. Retrieved October 9, 2006. ^ "Episode guide - episode 43 Margin of Error". HBO. 2006. Retrieved October 9, 2006. ^ "Episode guide - episode 44 Unto Others". HBO. 2006. Retrieved November 1, 2006. ^ "Episode guide - episode 45 Corner Boys". HBO. 2006. Retrieved November 9, 2006. ^ "Episode guide - episode 46 Know Your Place". HBO. 2006. Retrieved November 15, 2006. ^ "Episode guide - episode 47 Misgivings". HBO. 2006. Retrieved March 29, 2007. ^ "Episode guide - episode 48 A New Day". HBO. 2006. Retrieved March 29, 2007. ^ "Episode guide - episode 49 That's Got His Own". HBO. 2006. Retrieved March 30, 2007. ^ "The Wire episode guide - episode 50 Final Grades". HBO. 2006. Retrieved October 17, 2007.